TLAs- Three Letter Acronyms. You might know what they mean, but they don’t always translate to everyone sitting in the room. We’ve all seen eyes glaze over and the look of utter confusion when too many TLA’s are used in meetings. FYI, there’s a time and place to use acronyms. In any industry or organization size, there will always be specific language and short-hand communication. They really do have a purpose in your internal day-to-day communications. But for some organizations, there’s an acronym epidemic. TMI in these shortened phrases can cause catastrophic communication breakdowns. For example, we’ve heard phrases like, “You’ll need to work with the ABV group to create a presentation for the XYZ project at our next QBR.” So. Unnecessary. As a general rule of thumb, understand the audience you are speaking to in a meeting. If you’re absolutely confident that everyone in the room knows the details of every acronym, then use them. But if there is any question that everyone in the room might not know what they mean, don’t. There’s nothing worse than making half the audience feel dumb for not understanding what’s going on. They over-complicate your meeting – it can be challenging and draining trying to process and understand a meeting where TLA’s are thrown left and right. Everyone will be on the same page – instead of losing people in the meeting because they don’t understand what is being said, everyone will understand the dialogue. Fewer interruptions – eliminating TLAs should limit the interruptions because someone doesn’t know what something stands for. It clears it up from the get-go and will help keeping your meeting rolling. 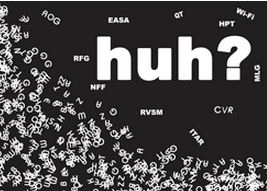 Acronyms are designed to give your organization the ability to streamline communication. However, overuse can do the polar opposite. It’s just a safer bet and better meeting practice to keep communication simple and to the point. At your next meeting, try making your team eliminate the use of TLAs. It could help keep everyone on the same page and make your meeting run more smoothly.